(PhysOrg.com) -- An experimental electric vehicle called "Schluckspecht" ("boozer," or "tippler" in German) has set the record for achieving the longest drive in a battery-powered vehicle on a single battery charge. Its record-breaking distance was 1,013.8 miles (1,631.5 km). The trip lasted 36 hours and 12 minutes. The Schluckspecht E, as the winning machine is called, was developed at Germanys University of Applied Sciences, Offenburg, in collaboration with other academic groups. The test drive took place in Boxberg at the Bosch corporate test track, where a team of four drivers made the trip, as they took turns navigating over the long stretch of hours. 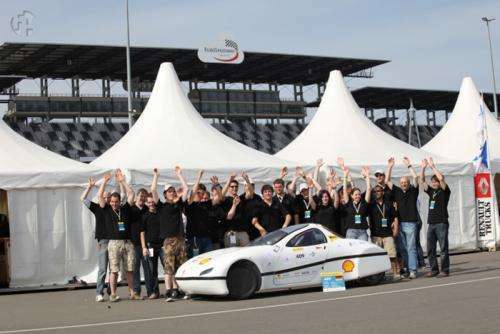 While nothing beats a world record, this is not the first time Team Schluckspecht has made the EV design scene sit up and take notice. 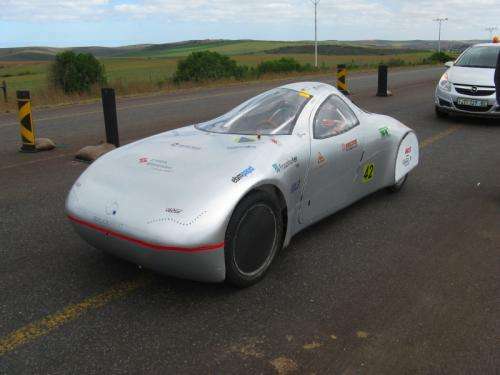 They also won attention at the South African Solar Challenge last year, driving 389 miles on a single charge. The team was founded in 1998. Their name Schluckspecht was taken because of their first car, a prototype gasoline vehicle that devoured too much fuel to be effective in competitions. After successive models with successive improvements, the team switched its technology focus. The aerodynamic design and weight efficiencies of the vehicle are singled out as reasons for the teams success. Those features are considered important because electric cars have tried to resolve the hurdle of range. Attempts have included charging station networks, and special range-extending engines, but the Schluckspecht team came up with a more optimal design to address range. They traded off comfort, being a single-seat experimental car, for reduced weight. The designers made use of two wheel-mounted hub-motors. There was no need to accommodate an internal engine or transmission. Their design represents a lighter vehicle with an efficient battery management system which evenly divides the load among 14 individual lithium-cobalt battery packs. The Schluckspecht victory beats a previous record of 1,003 km (623.23 miles) held by the Japan Electric Vehicle Club in May 2010. The Schluckspecht E achieved an average speed of 45 km/h (28 mph), while the Japan Electric Vehicle Clubs Daihatsu Mira averaged 40 km/h (25 mph) on a single charge. The Japan club's car achieved 1,003 km, approximately 623 miles, on a single charge, in a 27.5-hour timeframe. So the answer to the problems plaquing electric cars is to abandon the concept of a car and instead put an electric motor in a velomobile, and then drive it slowly. Heck, my car only weighs 800kg - and I could stand to lose another seat. Better battery management, good aerodynamics and dumping engineering concepts that make sense in combustion driven cars but not in electric ones seem strategies that still hold a lot of potential. If they pare it down so this car could go 500km on one charge with an average speed of 120km/h then I'm sold. Ah, but the base model is only $1,000,000, as shown $1,500,000. And don't ask about insurance. Electric cars prices are like gasoline prices - artificially high and completely controlled by greedy hands. I would still prefer a 2012 GT-R which does 0-100km/h in 2.9s. If that's the most important spec for you then you definitely will have to buy an elctric vehicle. It's one thing to go 28 mph in a car made out of bicycle tubing and glass fiber. It would be completely mad to take that thing up to highway speeds and expect that it stays on the road come wind or rain. 45 kph is way faster than most commutes around here. The aerodynamic drag is the big thing. On any car the wing mirrors can be anywhere from 20-50% of the total drag. A lot of the rest of the total is actually from the underside of the car. Slowing it down to 45kph achieves a lot for reducing overall drag. You can drive any brick shaped vehicle at those speeds and see big increases in mileage as a result. It's good for setting records like this but practically it doesn't translate to the real world. If you think about it when your are doing those speeds you are driving around town and it is definitely not nice stable cruising, it is stop and go. One thing that I find rather interesting about this is the multiple battery packs. That's a clever way of getting around low voltage problems near the end of a charge.All in all a well done for them. 28MPH... I should just ride my bike, then at least I'm getting some exercise. You know about that oil thing? They make gas from it. Well it is going away. Don't worry about SUV's. This thing will be sharing the highways with pedestrians, donkeys and bicycles. It's good for setting records like this but practically it doesn't translate to the real world. The optimized one factor. That's how you do these kinds of things: optimize one factor at a time (per group working on it). Then you start bringing together what all the other groups do. I want to see solar cells in paint jobs to supplement electric power. Im not sure that's sensible. Even if you had 100% efficient solar cells then the entire surface area of a car at midday under optimal sunshine conditions (no houses or other obstructions around you) would get you 1-2kW extra. In most other conditions the added energy would be negligible. Only German (and Russian) native speakers are able to pronounce "schluckspecht". I wonder how you would feel after doing 1000 miles on your bike at 28 miles per hour. I don't think even Armstrong could have done that even on flat ground. If you are in a good physical condition, you can quite happily produce about 200 Watts (.27HP) continuously for a day. The problem of velomobiles is, that there's no luxury in them. They're small, fragile, hot/cold depending on the weather, and have little carrying capacity beyond the driver. A car travelling at 100Kmh for 100Km - vs. - a car travelling at 50Kmh for 100Kmh. OK factoring in drag and the cube root as speed doubles - NO ONE and I mean NO ONE - except for me has ever factored in the fact that the car doing 50KMH has it's engine running for twice as long - as the car doing 100KMH. So in simple terms a car doing 100Kmh may get 10Km to the liter of fuel, and the car doing 50KMH, may get 20KHM to the liter of fuel - but - I think I may have gotten myself stuck here..
Because I know what I mean. The engine is running 2 X as long, over a given distance (in a frictionless engine) at 1/4 the power. You mean except for the government people putting up signs for 'reduced speed areas' in order to conserve fuel? And they thought of that about 25 years ago? Yes..You are right. No one (with the exception everyone but you) has thought of that. "...and the last horse crosses the finish line"
The more important realization is, that if they want this car to go 75 mph so it would be highway capable, that would be 2.78 times the speed, and 7.17 times the power used, so the range drops to 377 miles. Then you add proper brakes, proper wheels, proper headlights and signals, a proper frame with crumple zones, proper seats and airbags; you triple the weight and even more the rolling resistance, and have to increase the number of batteries to compensate which further increases the weight and size of the vehicle. Then you end up with a car that does "100 miles" under ideal conditions.